OBITUARY PUBLISHED IN THE TIMES NEWSPAPER, September 2008. ALAN CADDY was the lead guitarist in the 1960s band the Tornados, who had the hit single Telstar in 1962. Produced by Joe Meek, the disc swept to number one in Britain and the US, making the Tornados the first British group to top the American charts. With estimated global sales of more than seven million copies, Telstar remains one of Britain's biggest-selling instrumental singles. Meek was notoriously tone deaf, so it had been left to Caddy to work out the chord progressions and translate Meek's demo into a form from which the other group members could work. Caddy was to arrange the majority of the Tornados' recordings. Alan Caddy's father was a dance band drummer who also ran his own jazz club. At the Emanuel School in Battersea, the young Caddy was head chorister and leader of the school orchestra. As a treble, he regularly sang at Westminster Cathedral and he studied the violin at the Royal Academy of Music. But he was enthralled by the emergent skiffle and rock'n'roll, and switched to the guitar. After leaving school he worked as an estate agent and played the guitar in a number of semi-professional groups around Battersea. By 1958 he was regularly playing four or five nights a week. In 1958 his group was joined by the singer Johnny Kidd, and within six months it became known as Johnny Kidd and the Pirates. With Caddy on lead guitar, they cut a series of beat classics including Please Don't Touch, Growl, Feelin', You Got What It Takes, Restless, Linda Lu and Weep No More Baby. In 1961 the Pirates (by now with Clem Cattini on drums and Brian Gregg on bass) jumped ship and abandoned Kidd to tour Italy with Colin Hicks's Cabin Boys. The tour was a disaster and Caddy returned to Britain after just six weeks. A few months later he replied to an advert in Melody Maker. Taking Clem Cattini along for moral support he found himself auditioning for Joe Meek. Meek hired Caddy and Cattini on the spot. Along with Heinz Burt, George Bellamy and Roger LaVern, they became the Tornados. Caddy quit the Tornados in 1964 to co-found Sound Venture Productions. Now he was able to get involved with arranging and producing. He also released one collectable solo single, Tornado (1964). 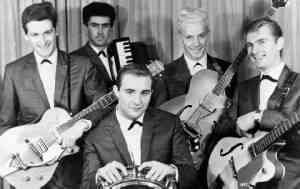 Most of the original Tornados reconvened in 1965 to release their own single, Spacewalk (very topical at the time), but they were banned from using the Tornados' name by a furious Joe Meek, who threatened legal action. Instead they were billed as the Gemini. They retitled the B-side Goodbye Joe. Caddy later worked as musical director and arranger for Polydor and for the singer Steve Rowland, but Rowland's career failed to ignite and instead he became a producer for the Fontana label, later calling in Caddy to arrange material for Dave Dee, Dozy, Beaky, Mick and Tich. Caddy also played on sessions and worked on arrangements for Tony Blackburn, Elkie Brooks, the Spencer Davis Group, Kiki Dee, the Pretty Things and Dusty Springfield. During the 1970s he joined the former Outlaws drummer Bobby Graham to do the arranging for Avenue Records, which specialised in budget LPs with cover versions of contemporary hits. He also released LPs with the Alan Caddy Orchestra, as well as playing and arranging for some 1970s Vince Eager releases on Avenue. Caddy's last public appearance was in 1991 at a memorable Joe Meek Reunion Concert at Lewisham where the original Tornados, inevitably, played Telstar. He is survived by the daughter of an early marriage.